Vietnam is on the brink of change. Before long Hanoi will look like other Asian cities. As the number of cars increase, the tunnel of trees lining the narrow main streets will be replaced with parking spaces. No longer will one be able to wander the main streets, stopping for a few minutes to see a craftsman squatting in the doorway of his shop making tin ware. Women preparing and selling food on the street will be replaced by fast food restaurants. Gone will be the barber clipping hair on the sidewalk. The last vestiges of "old" Hanoi will probably be the cyclo drivers who will serve only tourists, preserved to provide "local color." The best way to get to know Hanoi is on foot; wandering around absorbing all that is unique. Everyday life takes on the feel of street theater. People who feel walking the streets is too up close and personal may prefer to rent a cyclo for the day. The adventurous, or those with a death wish, may want to rent a motor bike! Vietnam is one of the last remaining Communist countries. Even though there are cracks in the system, its still the order of the day. Hundreds of people line up daily to see Ho Chi Minh lying in state in the manner of Lenin. In the adjacent park, visitors continue their homage at the House on Stilts where "Uncle Ho" lived and worked. 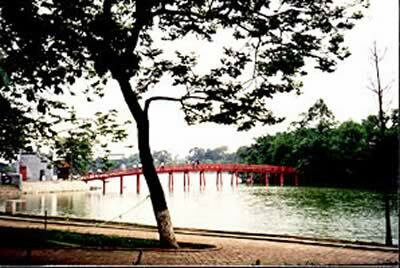 At the heart of Hanoi is Hoan Kiem Lake, the Lake of the Restored Sword. Reached by a picturesque Chinese-style red wooden bridge is Ngoc Son Temple. In a shrine at the back of the temple is the preserved body of a giant turtle found in the lake in 1968 substantiating the popular legend of the Restored Sword. Recently a live giant turtle was spotted and is seen as a good omen for the future of Hanoi. The Legend of the Restored Sword is one of the vignettes at the Kim Dong Water Puppet Theater. Water puppetry, a magical art form unique to Vietnam, originated in the village ponds in the north near the Red River Delta area. Today a dozen puppeteers stand in waist-deep water, invisible to the audience, manipulating the lacquered puppets in stories that transcend language barriers. 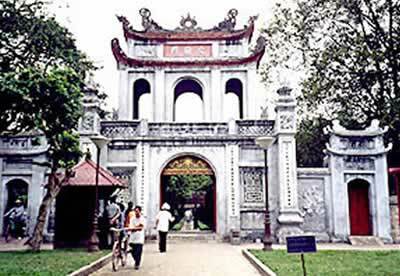 Hanoi's best-preserved ancient site is Van Mieu or Temple of Literature. Dating from the 11th century, it is the oldest institution of higher education in Vietnam. Dedicated to Confucius, it educated mandarins (high court officials) for more than 700 years. Musicians play in the courtyard, adding to the ambiance. Even though the Ho Chi Minh and the Army Museums try to keep the memory of the Vietnam War alive, most seem to have put the war behind. More than half of the Vietnamese were born after the war. Most of the infamous "Hanoi Hilton," (Nicole Kidman starred in the TV series of the same name) has been replaced by a modern skyscraper but a portion of it remains as a museum. Not far away the Hilton chain has a new hotel. An easy day trip from the city is to the village of Le Mat, where snakes are kept in readiness for those diners who have a hankering for snake washed down with snake wine (wine aged with a coiled snake curing in the bottom of the bottle). Hanoi has many excellent restaurants, where snake is not on the menu. Another popular day trip is to a village that makes pottery. Overnight trips to Halong Bay are easy to arrange. Hanoi is a city on the brink of transformation. Soon many of the sights that make Hanoi such a fascinating place to visit will disappear. The people are gracious, the food excellent, and the prices rock bottom. Signs of the hoped for tourist boom are everywhere. Now, before it changes too much and hordes of tourists arrive, is the time to visit Hanoi. 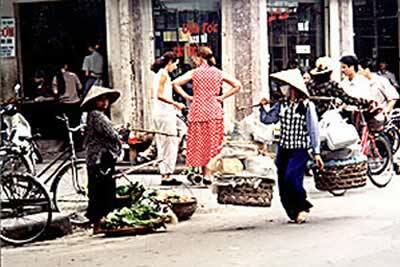 To visit Hanoi is to see Asia as it was decades ago.